She wore tails and a top hat at Eugenie's wedding –but we loved it! 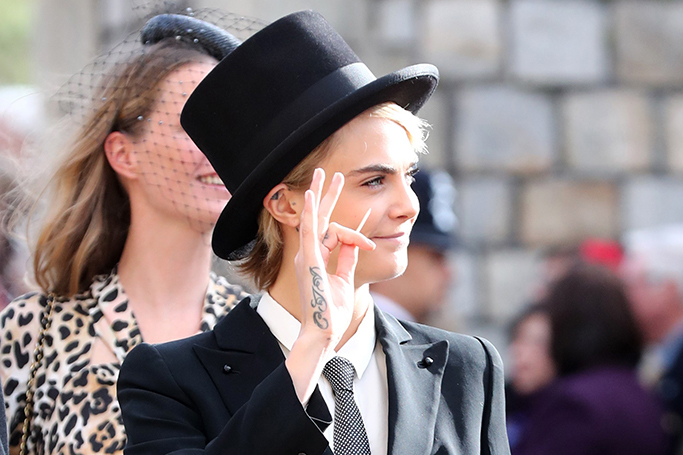 We were expecting the royal and A-list crowd at Princess Eugenie’s wedding to Jack Brooksbank to walk into Windsor Castle in an array of colourful guest attire – but Cara Delevingne’s outfit probably came as quite a surprise to most. The model and actress wore a tailored trouser suit with tails, a tie and a top hat, while the female guests around her all chose more traditional dresses –and she received huge praise on Twitter for her bold choice, proving that the best dressed wedding guest has to be a little controversial! It’s pretty untraditional for a wedding, never mind a royal one, so what does a bridal expert think? Hunt believed that Delevingne’s look was no more attention seeking than other guest rocking up in bright colours and Robbie Williams’ wife Ayda Field choosing to wear white. Despite being off-white, Ayda Field’s outfit has raised a few eyebrows –wearing white to a wedding is commonly considered a huge no-no, even more so for a royal wedding. Delevingne wasn’t the only guest to rock black at the wedding –Naomi Campbell looked fabulous in it. There’s no reason why a guest shouldn’t choose a black dress – even for a royal wedding – so long as it’s accessorised carefully and not too sober. Naomi has kept her look wedding-suitable by opting for a textured black knee-length dress with white detailing, and feather-lined bolero –which was a chic look in a sea of pink dresses. We’re taking notes from these controversial looks at the royal wedding; rules are there to be broken, right? !